Neighborhood Council Filing Forms are DUE this Friday, Sept 28th - Yo! Venice! 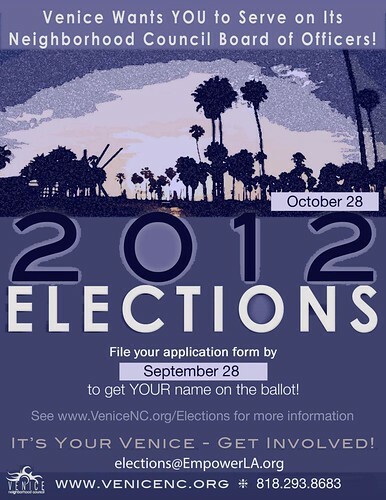 Interested in running for a position on the Venice Neighborhood Council? The Candidate Filing Forms for the October 28th elections are DUE this Friday, September 28th. 21 two year term positions on the council are up for grabs including President, Vice-President, Secretary, Treasurer and Chair of Land Use and Planning Committee.